Bird of Paradise. 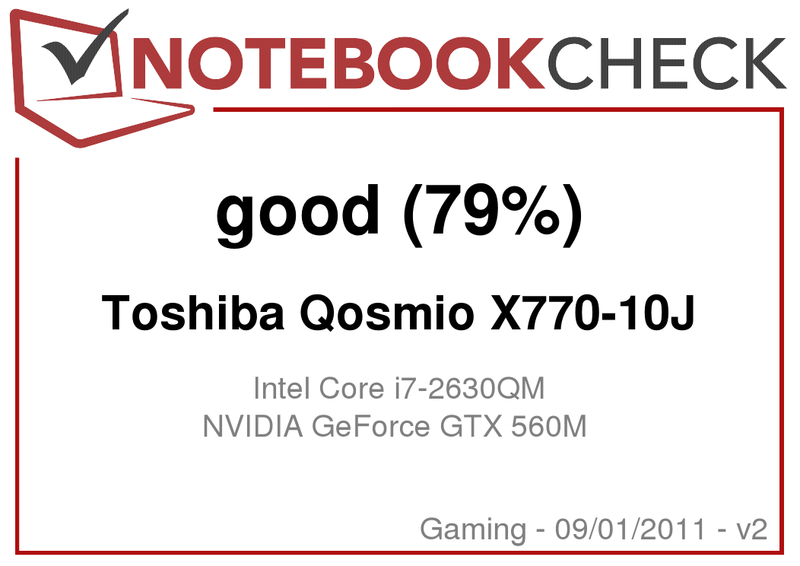 Never an easy feat for a laptop to stand out of the crowd of gaming notebooks, but Toshiba's Qosmio X770-10J pulls it off. The 17 inch notebook has it all: an interesting design, potent high-end hardware and clever features such as keyboard backlight and automatic graphics switching. All-in-all, a very well-rounded package which will be sure to entice more than a few buyers. The popularity of gaming notebooks has been on the rise of late. 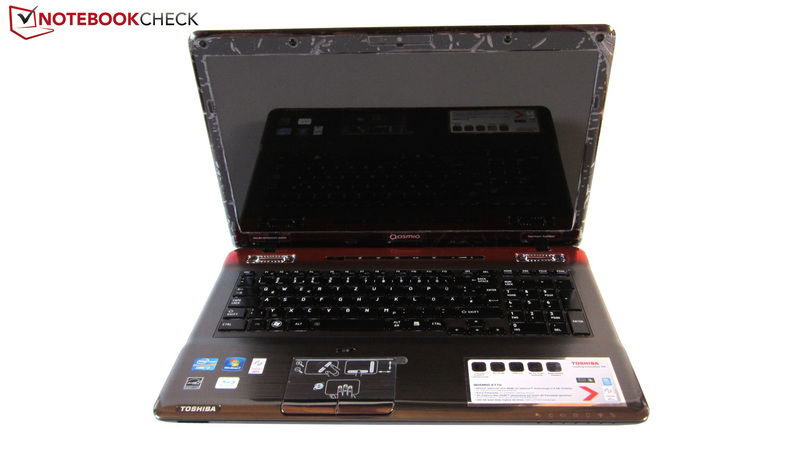 The price of such a notebook is high, even higher than of a similarly equipped desktop PC. However, enthusiastic gamers who are on the move a lot or go to a lot of LAN parties, will be very happy with the performance of these "desktop PC replacement" models. The Toshiba Qosmio X770 is an interesting gaming platform which will definitely attract a lot of buyers. At the time of this test, there were three different versions of the Qosmio available. The entry model cost us around 1300 Euros and is codenamed: X770-10J. The pricing may be high, but in return our 17 inch test model came equipped with very potent high-end hardware. Let us start with the graphic card: Toshiba has picked the DirectX 11-ready Nvidia GeForce GTX 560M. The processor, an Intel Core i7-2630QM, is currently a very fast mobile quad-core CPU. The 8 GB DDR3-RAM and the storage capacity of 1000 GB (500 GB SSH + 500 GB HDD) are equally attractive. The whole packet is rounded off with a Blu-ray combo drive (burns CDs and DVDs) and a HD+ display (1600 x 900). For another 100 Euros, the buyer can take home the X770-11W. The hard disk capacity increases to 640 GB, but the most important upgrade is the monitor: a 120 Hz Full-HD display, which, in combination with the "Shutter" glasses included in the delivery (Nvidia 3D Vision Kit), will allow the user to enter the immersive world of 3D films, pictures and games. The X770-107 (~1600 Euros) is the top model, and is even better equipped than the other two. 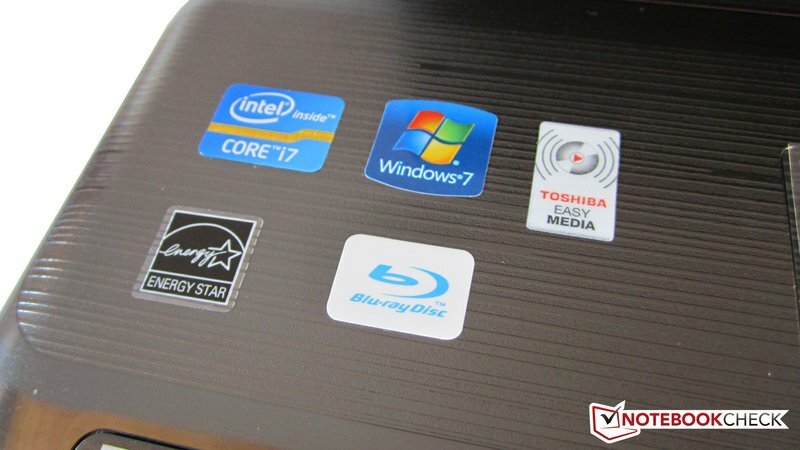 Instead of a Blu-Ray player, the laptop has a full-fledged Blu-ray burner. Toshiba wants to attract gaming and multimedia fans with this package. The biggest disadvantage of the 3D display laptops is that they lack Optimus, which means that only the cheapest notebook, the X770-10J, can automatically switch between the integrated and the dedicated graphic chip. For the case design, Toshiba went off the beaten path and found a unique and interesting design. The synthetic surface of our test model is adorned with a nice line texture, which sets the Qosmio X770 apart from the mishmash of consumer laptops. The colors are a matter of taste: Toshiba leaves the tried, old silver-grey finish behind and picks a new, attractive red for the laptop. The materials used seem good, and apart from the sensitive display borders and the glossy notebook bezel, the surfaces of our test model seem resistant to dust and fingerprints. The bottom of the laptop is extremely sturdy. On the other hand, the cover of the display can be distorted easily with both hands and the base unit can be bent inwards on both the right and left side. To be fair we have to mention that most notebooks have similar flaws. The workmanship of our test model is fine. All the parts are installed neatly and seamlessly into the laptop. The hinges left us with a mixed opinion. 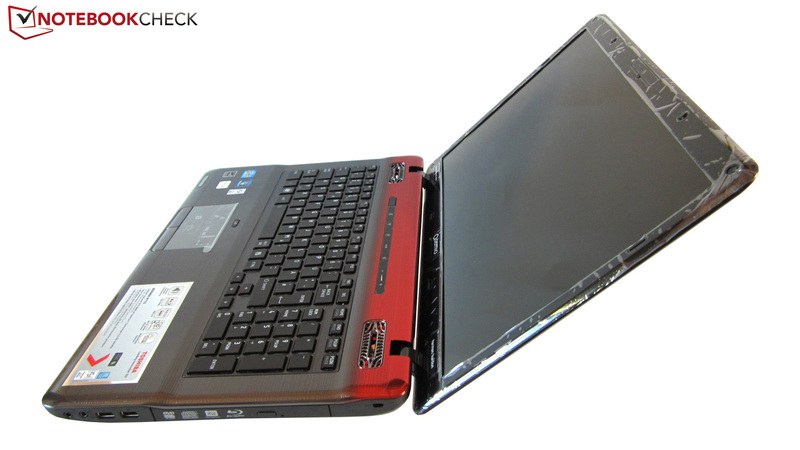 On the one hand, we are happy to see that the laptop does not swing along when the display is opened, but, on the other hand, the smallest movement of the base unit (such as while typing) can cause the display to wobble. In addition, the hinges are very stiff. 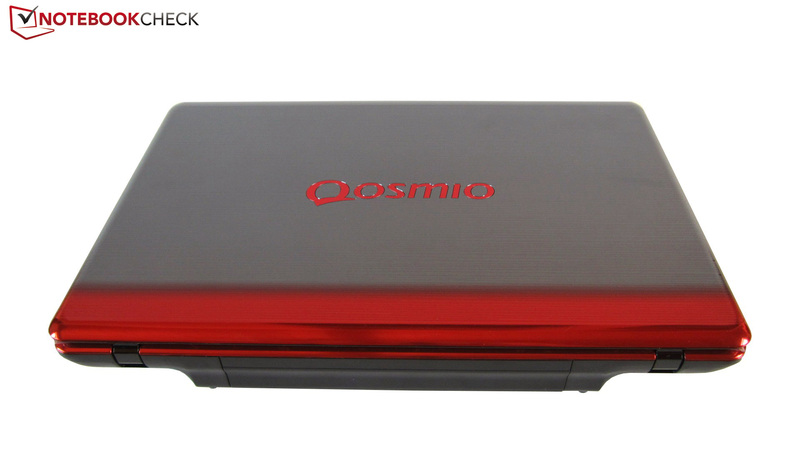 The Qosmio X770 weighs a proud 3.6 kilograms. 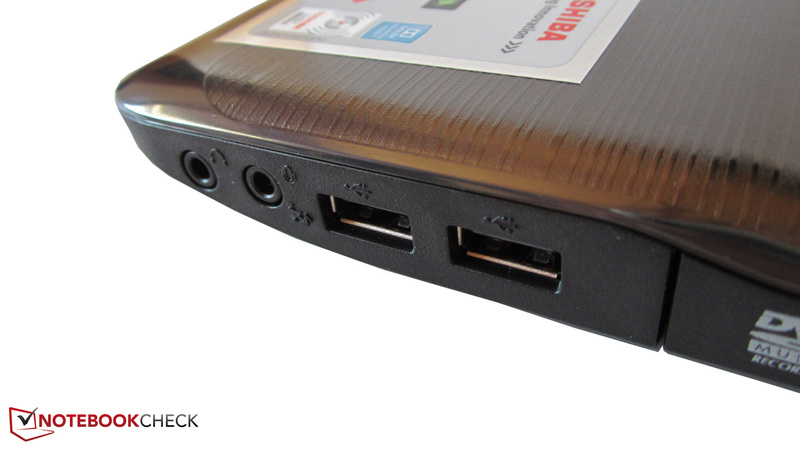 This, in combination with the large dimensions (the rear of the laptop measures six centimeters! ), means that users will not enjoy frequent transportation of this model. The notebook is primarily intended for stationary use. The offering of ports on our test model is very meager. Toshiba has not provided the X770 with an ExpressCard slot, Firewire or an eSATA port. 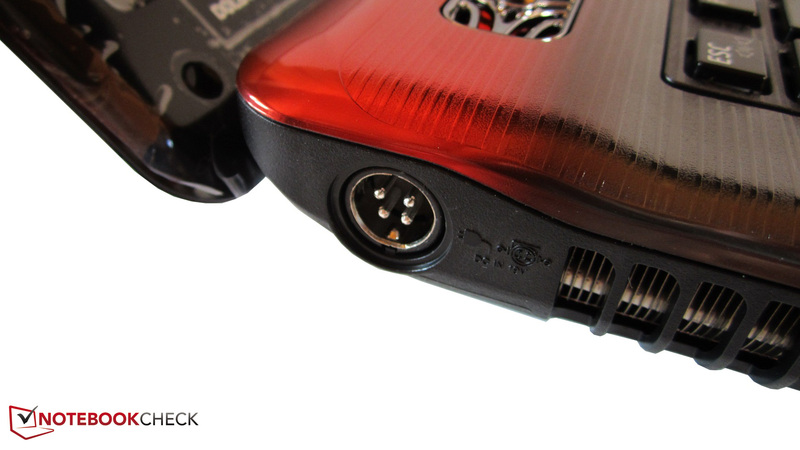 Only two sounds jacks are available for sound in-/output, but thankfully the HDMI interface can be used to deliver audio to surround sound systems. Video output is possible with both the HDMI and VGA interface. Toshiba has also installed a cardreader, three USB 2.0 ports and an USB 3.0 port. 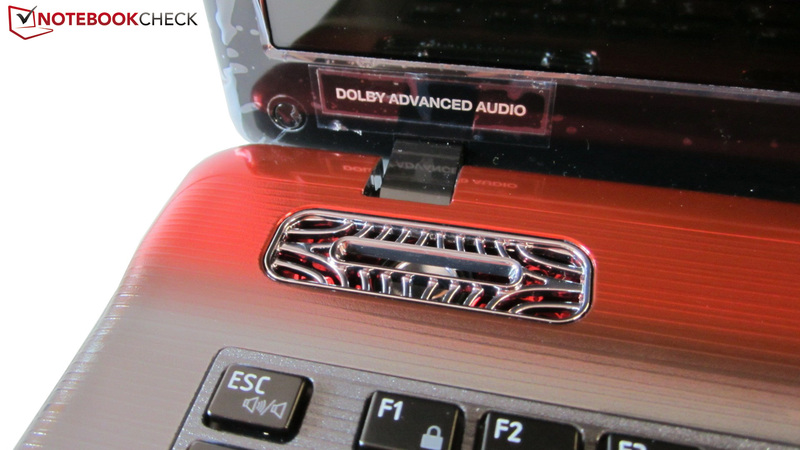 The Kensington Lock of the X770 can be used to secure the laptop and prevent theft. The positioning of the ports is not optimal: most of the ports are seated far up front. This means that when the ports are in use, the cables will clutter the workspace and limits the free space available. This is a big problem when the user has an external mouse connected. The communications modules are far more satisfactory. A RJ-45 Gigabit Lan port, and a WLAN module allow the use of wired and wireless internet. 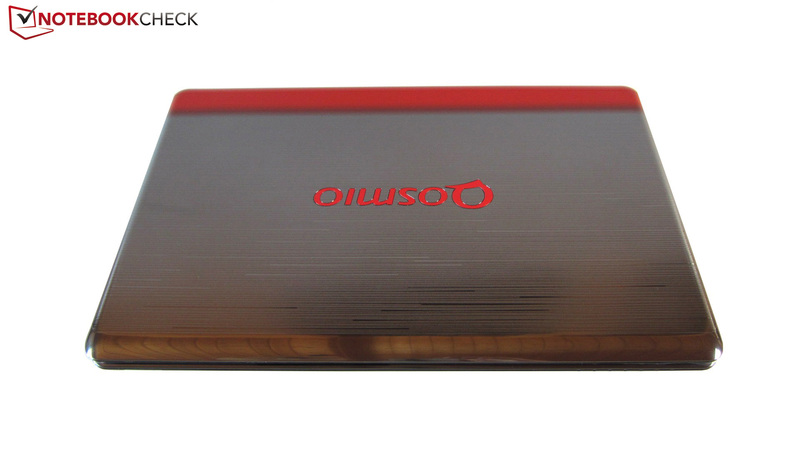 In addition, the Qosmio X770 is capable of Wlan b/g/n and Bluetooth 3.0. Toshiba has filled the X770 with programs. There are a lot of unnecessary programs (some thirty of them are named "Toshiba xyz" - see our screenshot). In short: the task bar is already filled with various icons and the user has to bear the constant pop-ups. The boot and reactions times also suffer. So we recommend the removal of unnecessary programs. Of the multitude of programs installed on the notebook, we found a few to be quite useful. For example, the Corel WinDVD software support Blu-ray discs which means that the user will not have to buy additional software. The Eco utility is also worth mentioning. This utility allows the user to decide on an every-saving plan and watch the overall consumption of the laptop. The PC Health Monitor (gives information about the system) and the optional HDD-Protection (recognizes vibrations) are also quite useful. The contents of the delivery package are few in number. 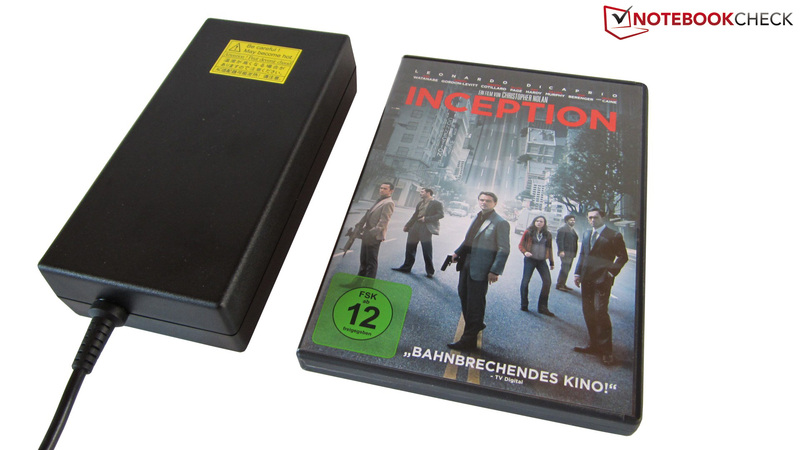 The battery and the power adapter (a heavy 180 W model) are included alongside with a short manual and a few booklets. The System-Recovery software is already placed on the hard disk on a hidden partition. Toshiba guarantees its customers a service period of two years (Bring-In). 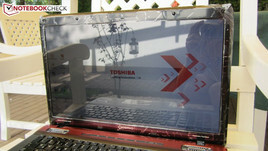 Users who register their devices with Toshiba can let their laptop be picked up (Pick-Up service). The input devices of our test model proved to be quite good. The chiclet keyboard has 14x14 mm big keys. The keys are placed freely next to each other, and are not too noisy while typing. The relatively soft typing feel may not suit everybody. We found that the stroke was too undefined, to be more exact, spongy. The layout of the laptop is not surprising. The 17 inch device has a separate numeric pad. The red backlight is a great feature, which can either be left on (or off) permanently, or be configured in such a manner so that it activates while typing. 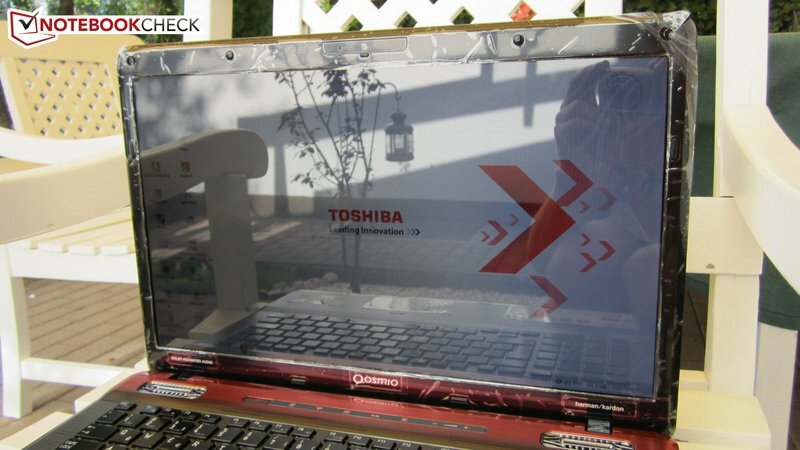 Toshiba has placed a touch panel above the keyboard. The volume, wireless module, Eco mode and backlight can be adjusted from this bar. The touchpad of the test model is even better than the keyboard. Toshiba deserves praise for the generous dimensions of 93x52 mm. This allows the user to move the mouse to any spot with ease. The slightly rough surface has just the right balance between sensitivity and input. 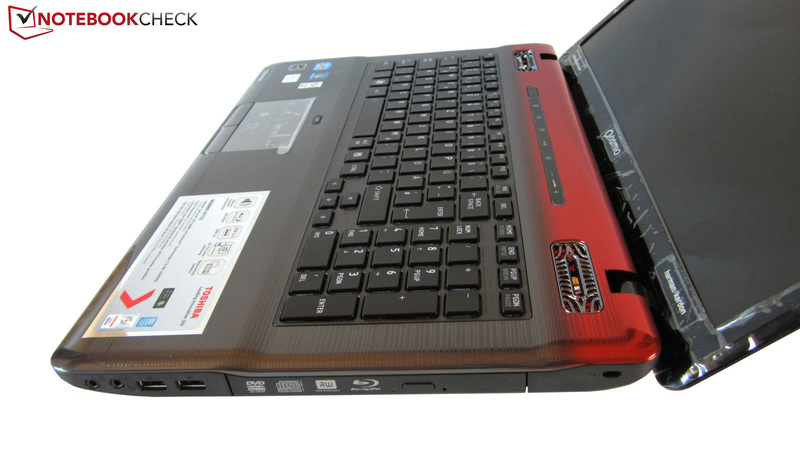 The touchpad can be easily located in the dark thanks to its red bar. The multi-touch support is another plus point. With the driver active, the user can zoom and scroll with two fingers. Standard scroll bars (vertical and horizontal) are also integrated. The touchpad is very precise and most of our input was executed properly. 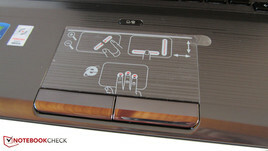 The touchpad can also be easily deactivated with the press of a button. However, we found the positioning poor. There is a large gap between the keyboard and the touchpad and the keys of the touchpad could have been better. The loud and rickety typing noise lowers the overall impression of good quality. Unlike the 11W and 107, the X770-10J does not come with a 3D ready Full-HD display (120 Hz). Instead our test model is equipped with a standard HD+ display (60 Hz). The resolution of 1600x900 pixels is just right for the graphic card as the GeForce GTX 560M usually does not have enough power to run the newest games at 1920x1080 pixels. Toshiba follows the trend and provides a 16:9 format and LED backlight for the display. Pity: the picture quality is not good enough for a multimedia or gaming platform. 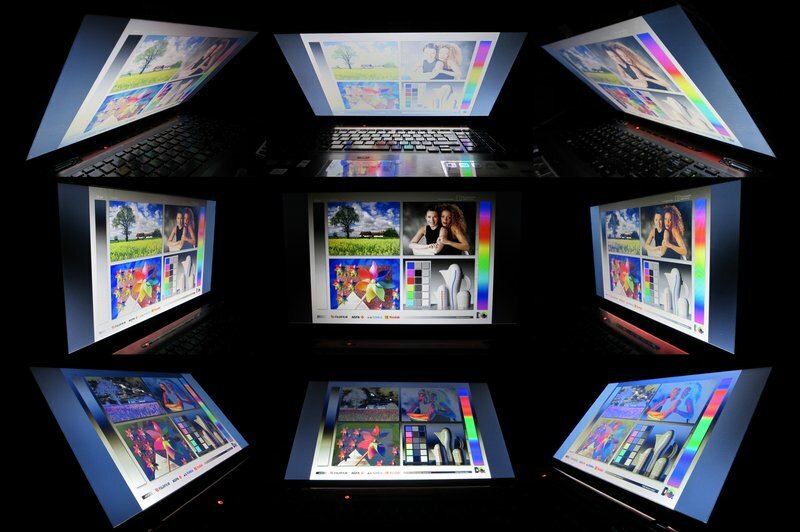 Toshiba has given the Qosmio X770-10J a run-of-the-mill 08/15 display. One of the biggest weaknesses is the high black value of 0.82 cd/m² which makes dark areas look gray. For a strong black, the value would have to lie below 0.4 cd/m². The contrast is also poor: 265:1. High-quality displays reach about three times this level (see the MSI GT780R). Despite the glare display, the colors do not appear saturated, which means that the atmosphere of games and movies will suffer. Only the brightness of 224.2 cd/m² (average) is good and is high enough to display all the content. The reflective surface of the screen is not suited for outdoors use. The user will be treated to annoying reflections outdoors as can be seen from the following pictures. The strain put on the eyes by these reflections is extremely uncomfortable. The user will soon wish for a matt display. Indoors, the reflections remain a problem, depending on the lighting and positioning. Not surprisingly, the viewing angle stability of the test model is not great. The picture alters quickly even with the slightly displacement and the monitor must be constantly adjusted. So the display of the Qosmio X770 is not suited for watching movies with a lot of people. Toshiba provides high program performance for the user by installing the Core i7-2630QM in the X770. The quad-core processor is based on Intel's Sandy Bridge architecture and has 995 million transistors and a 6 MB L3 cache (Core i5 series: 3 MB). The Turbo Boost function allows the user to easily overclock the cores of the processor from 2.0 to 2.9 GHz (speed may vary depending on CPU load). Another interesting feature is the "Hyperthreading" technology which allows each real core to simulate a virtual core, and, thus, allows the processor to work on 8 threads simultaneously (4 real + 4 virtual). The manufacturing process is the latest 32 nm, but the processor still consumes a lot of power. A 45 W TDP is quite high for a mobile processor. Intel makes up for the high power consumption by adding an integrated graphics chip (HD Graphics 3000). All-in-all, the Qosmio X770 is very well equipped and will definitely hold its own in the near future, as it is quite hard to push Sandy Bridge processors to their limits. The CPU benchmarks reveal just how great a processor the Core i7-2630QM really is. In the Single-Core-Rendering test of Cinebench R10 64 Bit, the popular dual-core Core i5-2410M manages to perform at the same level as the i7 2630QM. However, in the Multi-Core-Rendering, the 2410M did not stand a chance (see Schenker XMG A501) as it has only two cores, whereas our test model's 2630QM has four. The Core i7-2630QM takes the lead with 17018 points, while the i5-2410M stays far behind at 9781 points (a gap of 74 %). The disparity in results falls in the Cinebench R11.5 64 Bit: 4.26 vs. 2.61 points (+63%). In short: programs, which can use more than two cores, will be much happier with the quad core of our test model. Our test model has a GeForce GTX 560M which is a fresh DirectX 11-ready graphic card. The GTX 560M marks the start of the high-end Nvidia graphic cards. The only graphic cards which beat it are the AMD Radeon HD 6990M and Nvidia's own GeForce GTX 580M. In comparison to the GTX 580M, the GTX 560M has half the shaders: instead of 384, our card has "only" 192 units. On the other hand, the clock frequency of 775 MHz (core), 1250 MHz (memory) and 1550 MHz (Shader) is in part better than that of the GTX 580M (620/1500/1240 MHz). The GDDR5-Video RAM (192 bit interface) is smaller at 1536 MB, whereas the 580M has 2048 MB. The card has the been manufactured with the 40 nm process and is based on the GF116-Chip which is a member of the ambitious Fermi generation. The high performance of the GTX 560M is in part due to its high number of transistors: 1170 million. Currently, Nvidia graphic cards offer the most features. AMD cards offer video decoders and audio controllers like their Nvidia counterparts, but the Nvidia cards offer far superior features such as, PhysX: a half-way established standard for GPU-based physics acceleration. In addition, users who do not want to pay extra to get a model with a 120 Hz display can use the HDMI interface to deliver 3D content to an external 3D-ready monitor or TV. As mentioned before, the Qosmio X770-10J can dynamically switch between the integrated (HD Graphics 3000) and dedicated graphic chip (GeForce GTX 560M). 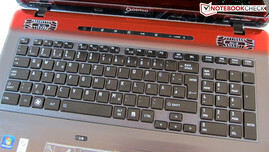 This automatic switching feature is thanks to Nvidia's Optimus technology, which can already be found in many laptops. As the Nvidia GPU remains off during less demanding tasks (such as, Office, Internet, Video etc. ), the power consumption remains within limits. This is of course good for the battery life. Optimus is a very refined and reliable technology, although it has a few issues which need to be ironed out. However, in everyday use, the user should not encounter any problems. Optimus runs in the background, and the user will rarely have to do anything. Another great feature is the automatic updates of the graphic switching technology. Users who encounter any problems should take a look at our advice in the Dell XPS 15. The graphics performance is above average (in notebook standards). In the latest 3DMark 11 (1280x720, Performance-Preset, GPU-Score) the GeForce GTX 560M (1777 points) positioned itself between the successful mid-range GT 540M (899 points @ MSI GE620-i748W7P) and the top gun GTX 580M (3110 points @ Schenker XMG P501). The beautiful Unigine Heaven 2.1 benchmark (1280x1024, High, Tessellation normal, DirectX 11) shows a similar result: 27.0 fps, which is about 100% above the score of the GeForce GT 540M (13.4 fps), but 40% lower than the GeForce GTX 580M (44.3 fps). The hard disks of the X770 are an odd pair: a 500 GB HDD (Seagate ST9500423AS) partnered with a 500 GB Hybrid model (Seagate ST95005620AS). This gives the user a mix of HDD and SSD. Thanks to the fast operating speed (7200 rpm) both hard disks can deliver high performance. In fact, the hard disk drive was slightly faster in our benchmarks than the SSH (= Solid State Hybrid). On the other hand, the SSH drive can perform better with files which are accessed frequently, as they are stored in the SSD flash cache so as to allow fast access. The system storage disk has a sequential read rate of 92.55 MB/s and a sequential write rate of 88.98 MB/s. The HDD managed 109.6 and 108.7 MB/s in the CrystalDiskMark benchmark. Even the access time of the HDD was slightly better (15.4 vs 17.0 ms). Still, the HDD/SSH duo is a nice idea. 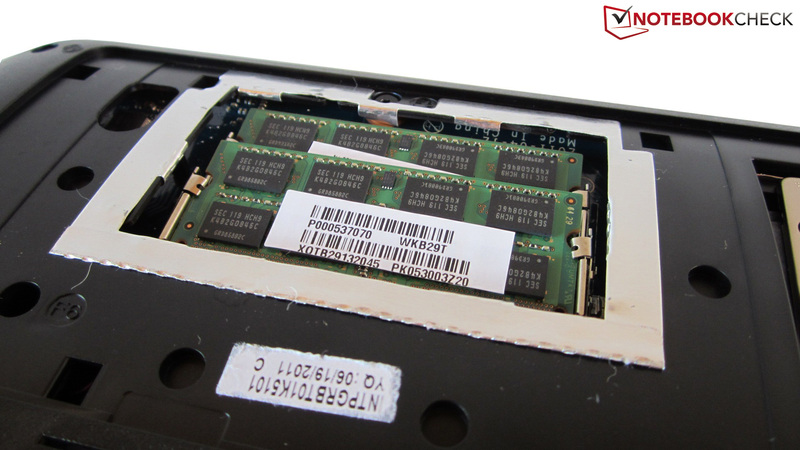 Tip: those users who have a little extra cash should consider the purchase of a Solid State Drive (SSD). This will boost performance significantly, and installing the SSD will be easy as both hard disk slots can be accessed easily. We checked the overall performance of the system with PCMark Vantage. 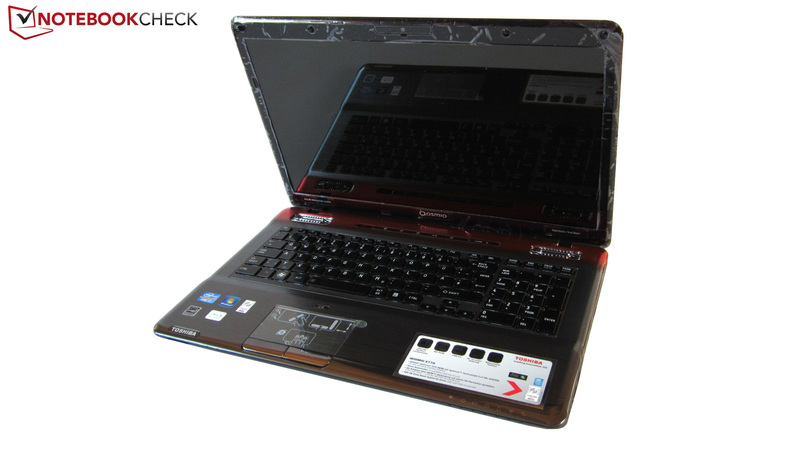 The score of 7895 points is typical for gaming notebooks. The slightly old Asus G73SW-TZ083V (Core i7-2630QM & GeForce GTX 460M) scored equally high: 7847 points. For a better result (10000+), Toshiba could have installed an SSD in the Qosmio X770. In PCMark 7 the notebook delivered 3001 points. We tested the Qosmio X770 with a few games to see how well the GeForce GTX 560M could perform. The well-designed racing game Dirt 3 pushes the Qosmio X770 off the edge at maximum details. The resolution of 1920x1080 pixels, 4x Anti-Aliasing (AA) and "ultra" settings slowed the integrated benchmark down to 22 fps, which is similar to the result of the Asus G74SX-3DE (22.6 fps - Core i7-2630QM and GeForce GTX 560M). 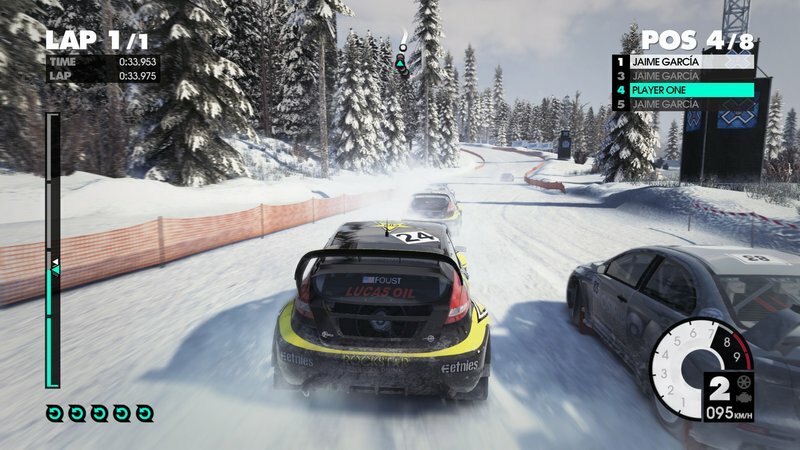 Dirt 3 runs fluidly with high details and the native resolution. The Fraps tool measured an average of 65.8 fps (incl. 4x AA). The epic Ego-Shooter Crysis 2 does not bow to the GTX 560M. A resolution of 1920x1080 pixels, "Extreme" settings (without DirectX 11 and High-Res-Textures), the intro sequence of the single-player campaign ran at a meager 20.9 fps. To run this game at such high settings, a GeForce GTX 580M or Radeon HD 6990M. would be needed. The Alienware M17x R3 displays the U-boat trip of the intro sequence at a passable 36.0 fps. With the native resolution and high details, the X770 can deliver a good 48.2 fps, which should satisfy most users. The highly profitable Call of Duty: Black Ops game from Activision is not a problem for our Qosmio X770-10J. 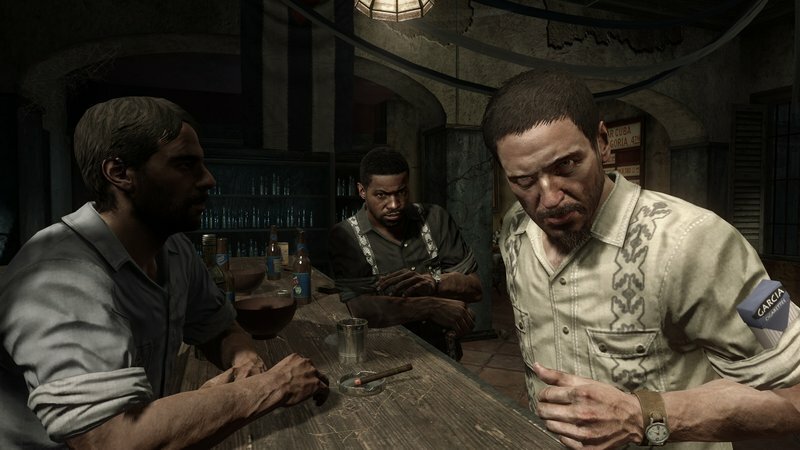 The first mission of the single-player campaign (street fight in Cuba) could even be run at 1920x1080 pixels, 4x AA, 8x Anisotropic Filtering (AF) and "Extra" settings. A frame rate of 61.2 fps is very good and lets the game run fluidly. The older GeForce GTX 460M places slightly behind; we measured 59.3 fps with the Medion Erazer X6813. The performance of the GeForce GTX 560M varies depending on the resolution. Although the graphic card usually has enough power to run games with high details and quality improvement features (AA and AF) in the HD+ format (1600x900), it lacks enough juice to deliver the same results in Full-HD format (1920x1080). 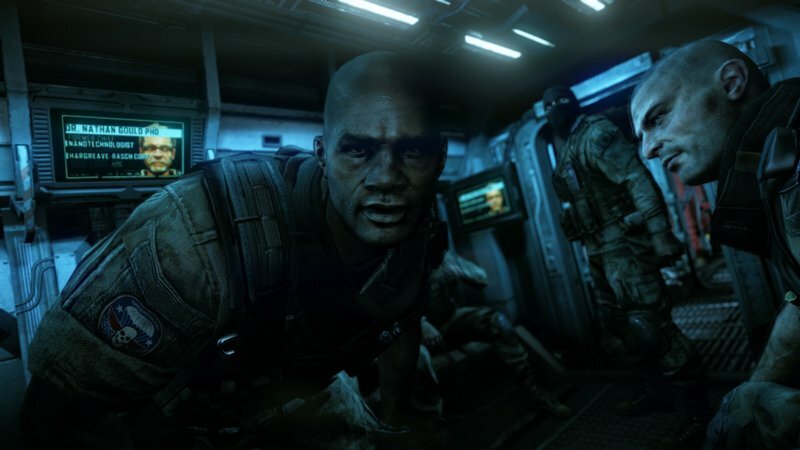 Anti-aliasing with demanding games like Crysis 2 are out-of-reach, and so are maximum details. 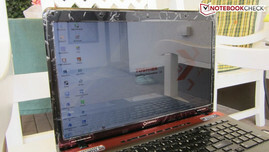 Still, users who enjoy gaming and are not willing to shell out more than 1500 Euros for a notebook, will find the GeForce GTX 560M the answer to their prayers. The graphic card deliver good performance as a mobile companion. Passionate gamers, on the other hand, should consider paying more and getting a high-end GeForce GTX 570M or Radeon HD 6970M. The fastest gaming platforms currently are available from the Clevo-Barebone providers (Schenker, Deviltech etc.) and Alienware. 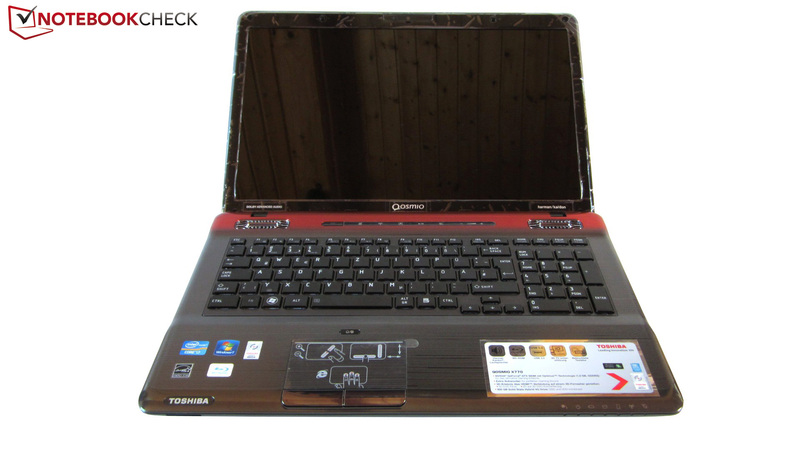 Back to the Qosmio X770: let us take a look at the temperature and noise emissions. 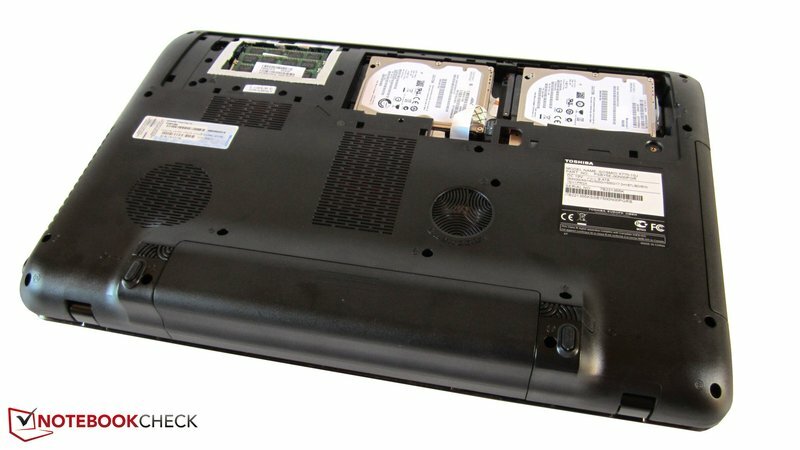 Has Toshiba designed a good cooling system for the laptop? While idle, or when the laptop is running less demanding programs, the noise emissions remain within acceptable limits. The case cooler fan is constantly running but the user can still comfortably work with the notebook. While gaming, the cooler fan turns up noticeably after a period of time. At that point, the 17 inch model is clearly audible, and depending on the genre of the game, can even drown out the game sounds. The optical drive is another problem. We noticed that while the drive was playing a DVD or a Blu-ray, it hummed. Still, this is not noticeable as long as the volume is not muted. All-in-all, the noise emissions of the notebook are not too bad and not too great. Users should not expect low temperature emissions from the Qosmio X770. When the laptop is under heavy load, the case heats up noticeably to a maximum of 40°C in the hand-rest region. Over a long period of use, this can turn uncomfortable. While idle, the notebook remains far cooler. We measured 33°C with our tools - a moderate value. No ugly surprises wait for us beneath the cover. According to the HardwareMonitor tool, both the graphic card and the CPU remained below the 80°C mark. However, in our stress test (Furmark & Prime), we encountered a severe throttling problem from Nvidia's GeForce GTX 560M. The graphic card clocked down to a much lower frequency. The throttling of a graphic card is much rarer than that of a CPU. Thankfully, this GPU throttling only occurs when the laptop is under full load. (±) The maximum temperature on the upper side is 40.8 °C / 105 F, compared to the average of 39.3 °C / 103 F, ranging from 21.6 to 68.8 °C for the class Gaming. (-) The palmrests and touchpad can get very hot to the touch with a maximum of 40.8 °C / 105.4 F.
(-) The average temperature of the palmrest area of similar devices was 28.7 °C / 83.7 F (-12.1 °C / -21.7 F). The great sound system is by far the best feature of the Qosmio X770. Toshiba developed the sound system in co-operation with specialists Harman/Kardon. The sound output of the notebook (two speakers) is by notebook standards unusually voluminous, natural and immersive. Thanks to the in-built subwoofer, the bass is also quite good - games, films, and music can really be enjoyed. The Audio-Enhancer function in the Dolby menu (which can be found in the "Speaker Properties" - see screenshot) boosts the sound output further. External speakers are not necessary and Toshiba has done extremely good job designing this speaker system. 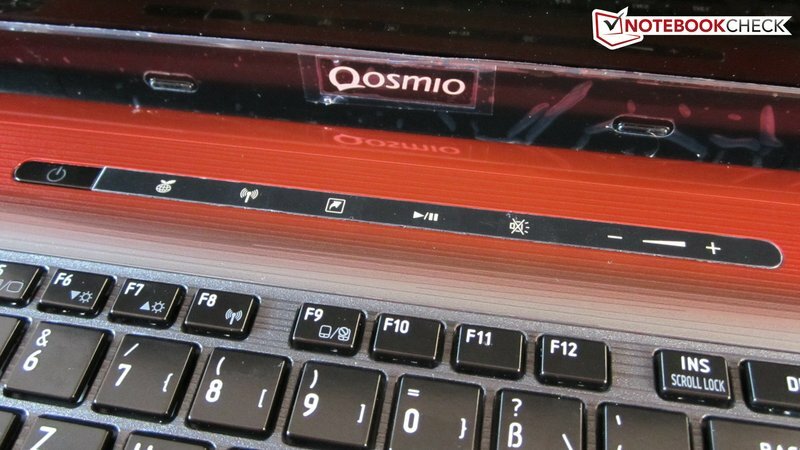 Very few notebooks, such as the Dell XPS 15, can hold their own against the sound output of the Qosmio X770. The sound system is great, but the maximum volume could have been a little higher. The Qosmio X770 consumes very little energy (12.5 - 16.9 W) while idle with the Nvidia GPU deactivated. We usually see such low values in Office notebooks . 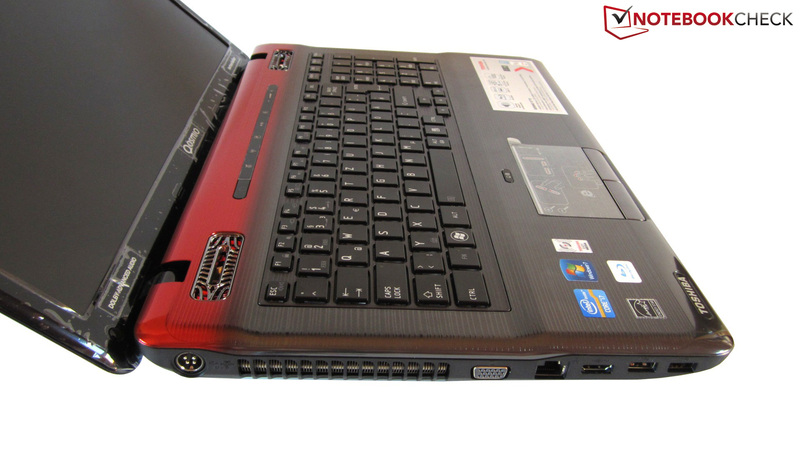 Under load, the GeForce GTX 560M takes over the graphics processing and the power consumption shoots up drastically to: 112.8–194.0 watts which is typical for a gaming notebook of the higher class. In comparison: a similarly equipped MSI GT780R consumes 123.8–195.0 watts under load (Idle: 24.9–34.8 watts). A look at the expected battery life will disappoint many users. The use of Nvidia's Optimus technology is worthy of praise, but this amazing feature does not help much as the manufacturer has equipped the laptop with a 47 Wh battery. 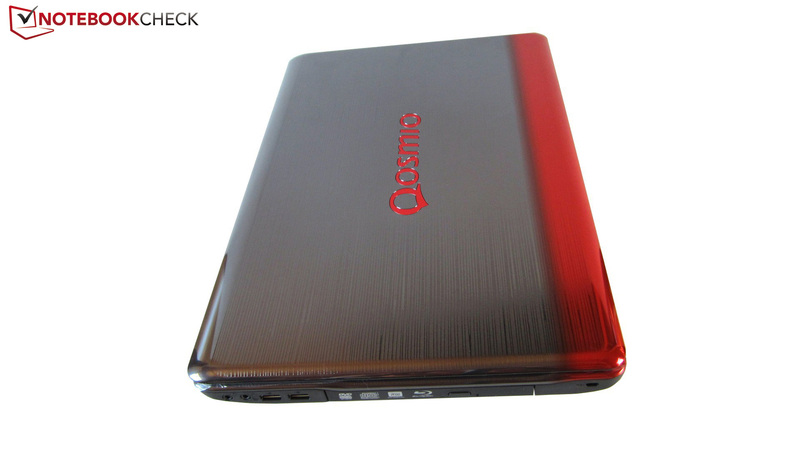 At best, that capacity is moderate and in respect to the battery size (460 grams) it is quite meager. We expected at least a 70 Wh battery. Under load, the 17 inch model quickly loses power. In the Classic Test from Battery Eater with maximum brightness and no energy-saving the test model lasted all of 41 minutes. The run time while playing a DVD (moderate energy-saving) is not amazing, but is sufficient: two hours and 14 minutes. Wireless surfing is possible for a mere three hours. For longer runtimes, the display brightness has to be set to the minimum and the energy-saving options have to be all turned on. 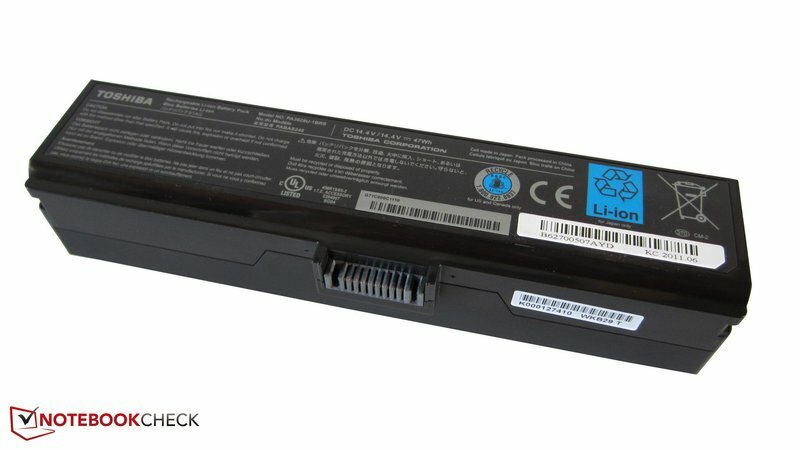 The Readers Test from Battery Eater showed that the 17 inch model can last a maximum of 6 hours. 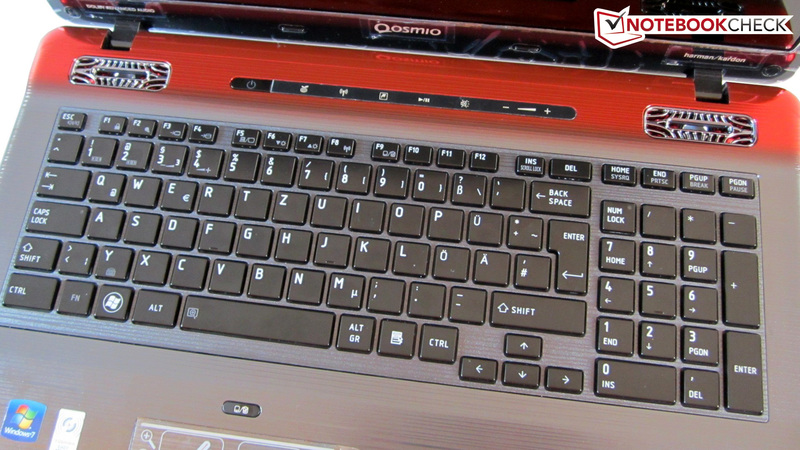 Overall, we found the Qosmio X770-10J to be quiet good. Toshiba has launched a model with a unique design and many interesting features. The unusual color scheme and amazing sound system of the 17 inch laptop allows it to stand out of the crowd. 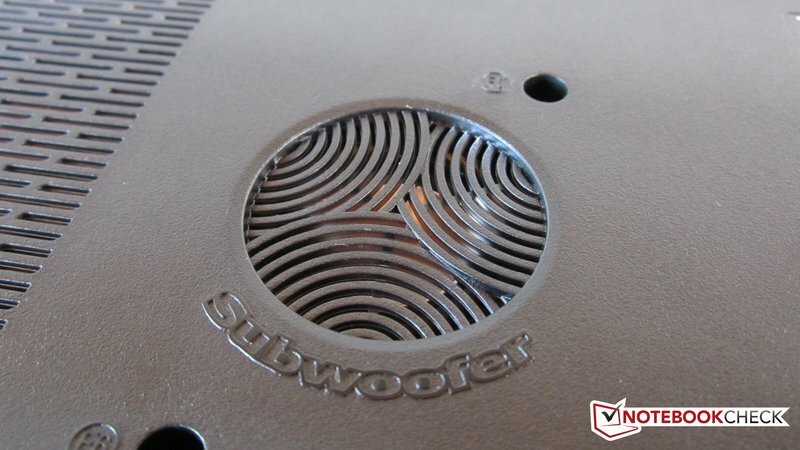 The integrated 2.1 speaker system has a great design and the speakers and subwoofer offer flawless sound. The keyboard backlight is another great features which is not always found in notebooks. This allows the user to work in the dark with ease. The good performance is another highlight of the model. The Intel Core i7-2630QM delivers fast performance regardless of the task. Modern games run well on Nvidia's GeForce GTX 560M, even with high details. 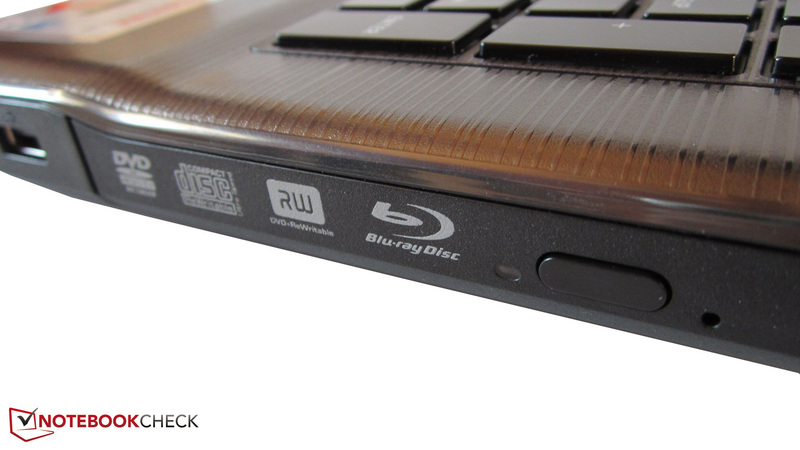 Film lovers will be happy with the Blu-ray combo drive. Sounds like the perfect gaming laptop, right? Well almost. In some areas, the Toshiba Qosmio X770 still needs a bit of tuning. For example, the display quality is extremely poor. Users expect a good display for the price of 1300 Euros. However, Toshiba has picked a typical cheap panel for the Qosmio X770-10J, which simply does not belong in a high-end notebook. Thankfully, in the more expensive 3D-ready laptops, Toshiba did install a good display. The meager connectivity (no ExpressCard, eSATA or Firewire), wobbly display cover, and limited mobility (weight/size/battery life) are a few more negatives. In conclusion: the gaming notebook falls short of a 80% rating by a smidgen. 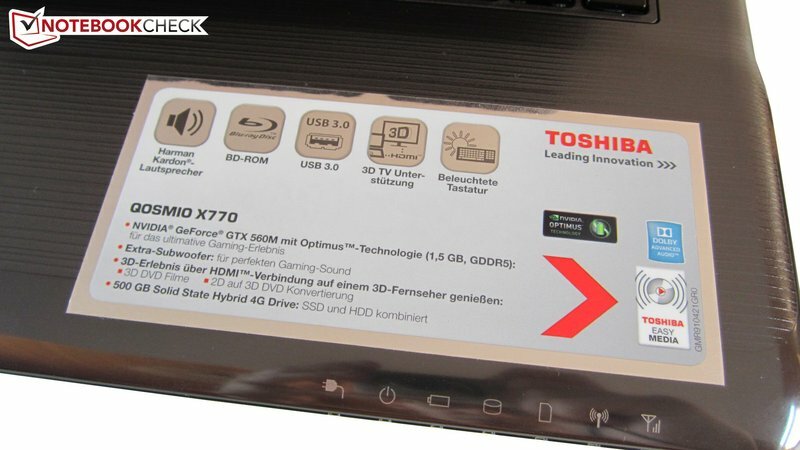 Buyers, who are not concerned with picture quality, or who want to use an external monitor, will find the Toshiba Qosmio X770-10J to be a very interesting model. 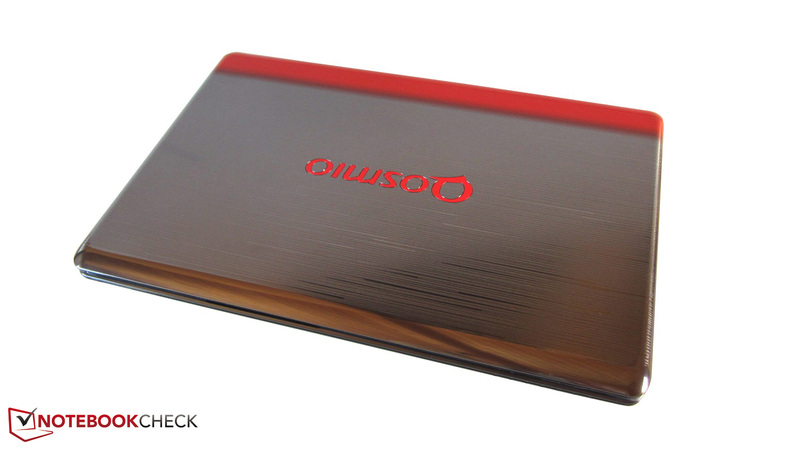 The new Qosmio X770 stands out of the crowd thanks to its design and colors. The X770 has Dolby Advanced Audio. A touch bar is placed above the keyboard. 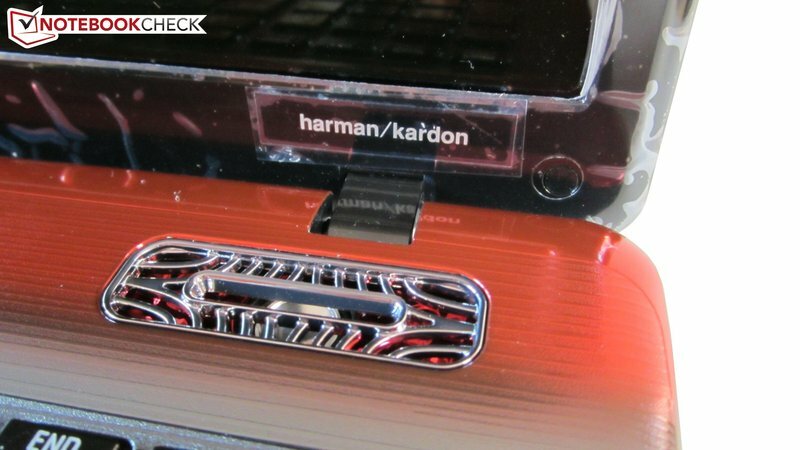 The sound system of the laptop was built by Toshiba in co-operation with Harman/Kardon. Both the processor and graphic card are high-end. The subwoofer provides decent bass. 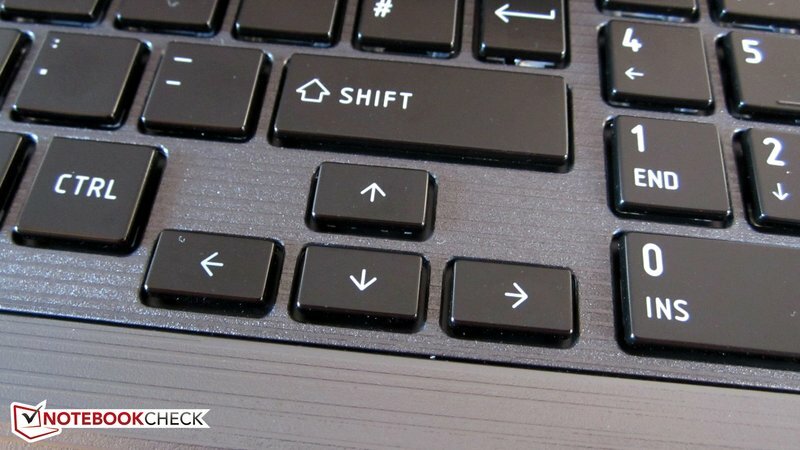 The cursor keys should have been raised a little more. A luxurious Qosmio inscription is placed on the display cover. The color combination is a matter of taste. A nice feature is the keyboard backlight. Various gestures are supported by the touchpad. 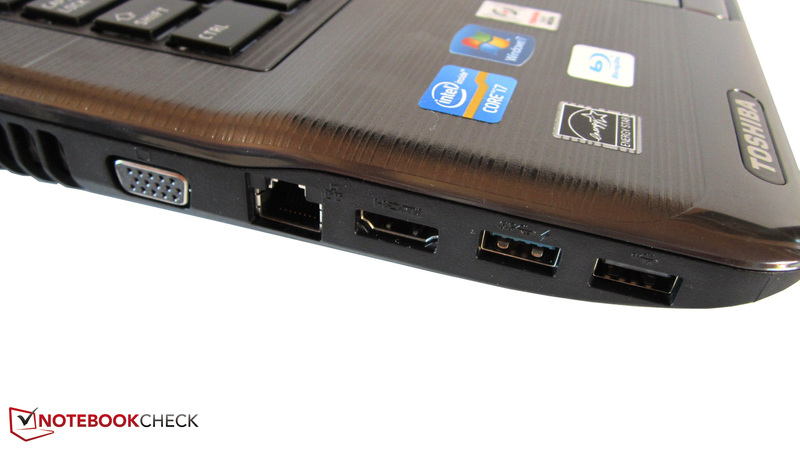 Two USB 2.0 port and audio jacks are placed on the right side of the notebook. 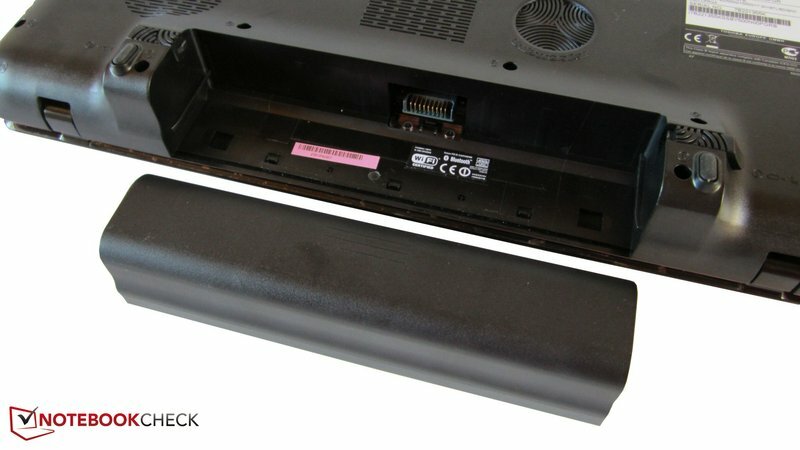 The Blu-Ray drive can burn CDs and DVDs. A Kensington Lock can also be found on the laptop. The high-end hardware requires a lot of power under load. 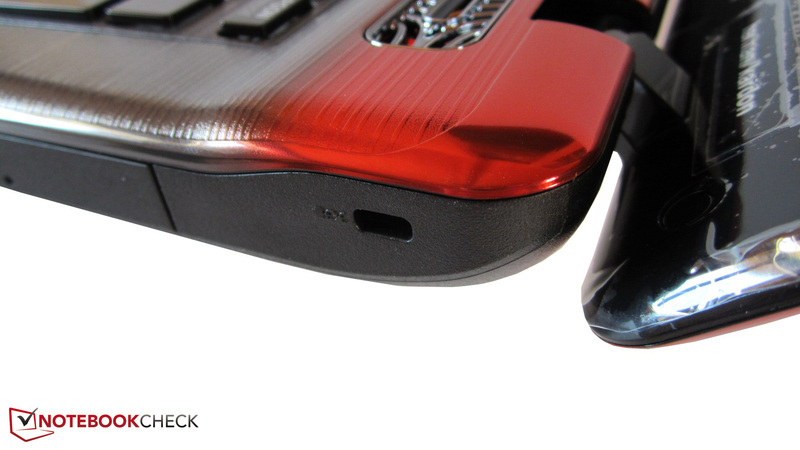 A USB 3.0 interface is placed on the left side of the model. ...but it has a small capacity 47 Wh. The cover is relatively wobbly. The X770 is not well-suited for frequent transportation due to its weight of 3.6 kilograms. Overall, the input devices are quite good. The cover and upper surface have a unique line design. The maximum opening angle is the notebook standard. 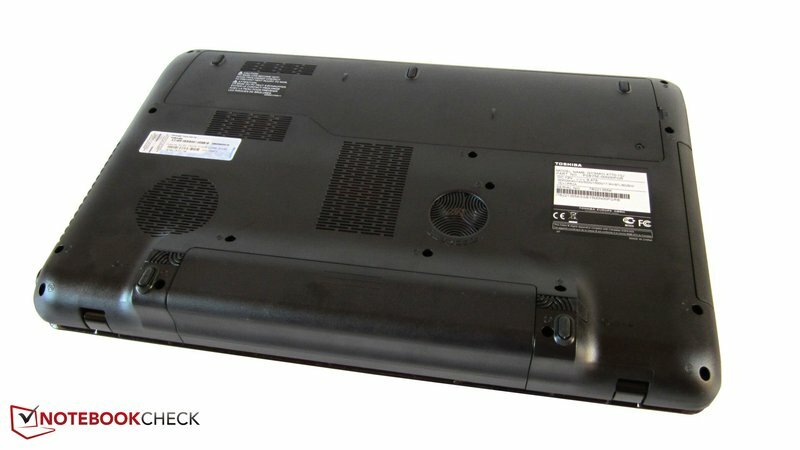 The back of the laptop measures 6 centimeters. Various reflections appear on the glossy surface of the display. The notebook is not very attractive from the back. The display borders are very sensitive. Most of the ports are placed up front. But ExpressCard, Firewire and eSATA are missing. ...which allows the user to access the hard disk and the RAM. Toshiba has installed 8 GB DDR3-RAM (2x 4096 MB). Both hard disks have a capacity of 500 GB. The delivery package includes a fat 180 W power adapter. The practical backlight of the keyboard. 17 inch gaming notebooks based on the Sandy-Bridge generation include models such as: the Alienware M17x R3, the Asus G74SX-3DE, the DevilTech Fragbook DTX and the MSI GT780R.